Our series on REMA continues. We’ve looked at the Rollercoaster games, next up: Experiment games! The most complex and messiest of games. The most random and yet most interactive of games. Onward! Recall Experiment mode is the second phase of any learning process. When in Experiment mode, we ask ourselves: “Now that I know what tools I have, what can I do?” “What can I achieve?” It is the mode of over-enthusiastic scientists, the mode of explorers, the mode of game dynamics. The mode for players who want to discover the systems that craft themselves from the game mechanics they’ve learned. Experiment games are games that emphasize Experiment mode. Experiment games are about exploring systems through choice. They are the “Or” games. I can do this or that. Where there’s no one best option, but there are lots of interesting options. They are the games in Sid Meier’s “A series of interesting choices” game definition. The games for Johnny (of Mark Rosewater’s Magic: The Gathering psychographic profiles*). This is not your polished, trimmed mega-hit. This is the home of the mechanically behemoths, giant inventories, and open worlds of gaming. The Experiment designer’s primary role is to provide interesting tools and systems that create predictable results. 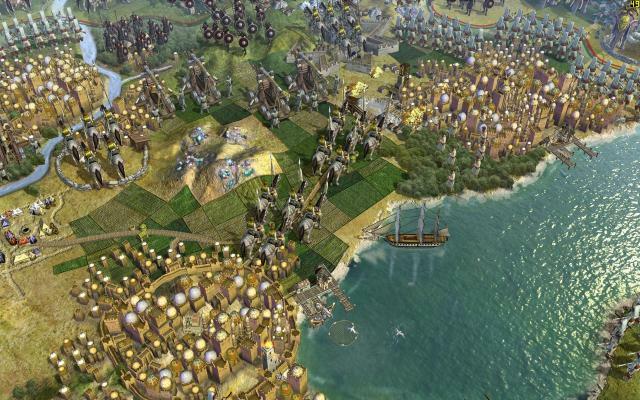 Civilization, The Sims, SimCity are the granddaddys of this genre. But the first was possibly Dungeons & Dragons (1st & 2nd editions), which had simulation at its core (see their rules breadth and what they publish as supplements). For other examples, consider X-Com, which asks “Anything could be out there, how are you going to deal with it?” Or Minecraft – where the core Experiment play is not the simulation per say but what you can do with it. Or Dwarf Fortress and Animal Crossing – Experiment games that present worlds of gameplay options instead of simulation. Experiment games are also the true home of emergent and open world games like Skyrim, Deus Ex, Bioshock, and Grand Theft Auto 3, which have long struggled with their Rollercoaster roots. All Experiment games share a common heritage of play. Experiment games are the home of choices, and encompass system investigation and the surprise of discovery. Thus, it is the genre of games closest to toys, and much of its design springs from the same place, if for an older audience. Man, I love me some Experiment games. Ahem. Experiment games are driven by their rules. They are the gamiest of games and the most computational of games. They craft elegant simulacrum out of rules. They think about the real world. They ask “What if?” with interaction. And man, compared to other games, are they strange. High Number of Choices. Experiment games are all about seeing what things do when they interact. So you need a lot of things. Emergent Choices. And you get even exponentially more choices if you have the choices affect each other. Interdependent Choices. Even better, interconnecting choices together can create new choices and complex decisions. Procedural. And procedurally generating choices can create choices forever. Mwhahahahahaha! Long. Seeing what happens with all these choices takes time. Particularly when choices are dependent on earlier choices. Yet Still Replayable. Despite being Long, the large number of choices encourages players to start fresh several times. Predictable Impacts. Making frequent choices means rapidly understanding what they will do. This becomes even more important when there are lots of choices interacting at the same time. Digital Choices. Choices with discrete states like [on/off] or [0…10] (as opposed to analog choices like aiming or free moving) have outcomes that are much easier to predict, follow, and replicate. Low Consequences. Likewise, low consequence (and thus low challenge) let players explore their options freely and repeatedly. Not to mention, if there are only a few relevant choices, well, it wouldn’t take long to figure out the best ones, would it? Time to Think. Low challenge digital choices mans few physical challenges (things like click speed or reaction speed). Plus, giving you time to consider all the magnificent ramifications of your options before you select one creates the illusion of even more choices. Mystery. Even though clear immediate choices with low consequence are desirable, Experiment games want to preserve a sense of long-term mystery. Otherwise, the right choices would be obvious, so why would you even bother experimenting? Randomness. Experiment games also use the most randomness, because randomness makes picking the same choice twice more interesting. Randomness is also very useful in building interconnected choices, maintaining mystery, and making choices and simulations seem more varied. System Driven. Experiment games, being choice-driven, are about systems first, not content. This means they are built in a completely different way, relying primarily on top notch design rather then polished art, sound, and other data. Experiment development teams are much smaller then the modern Rollercoaster teams and use different production techniques. System State Ending. Being system driven, the end of an Experiment game is defined by reaching a specific rules state, not reaching the end of a content flow. Varied, Internal Success. Accomplishments in Experiment games are defined by reaching rules goals. Most of the time players are involved in choosing their own end state, rather then the designer. Sometimes the systems suggest an obvious end (such as “other players are eliminated”). Other times, winning is not defined or is defined outside the main game and often ignored. Have you “won” Minecraft? One Large Place: Because of the large number of interconnected choices, Experiment games fold in on themselves, repeating interactions in same space. Thus, instead of a journey, Experiment games are like sandboxes – self-contained worlds that you traverse many times. Mixed Narrative: Experiment games are so simulation-oriented and player-driven they are not usually a good fit for narrative messaging. Plus, it is difficult for designers to craft a narrative that occurs during play. Some messages can be embedded in the content (usually in the form of radios or overheard dialog), but these are often undermined by the stronger messages embedded in the systems themselves, which take time and expertise to decipher. Experiment games also often form the seeds of Player-defined Narrative, which ties them closely to the Application mode of play. Of these, High Number of Choices, Emergent Choices, Procedural, Time to Think, Randomness, Varied, Internal Success, and One Large Place are all unique to Experiment games, and the others differ from either Rollercoaster or Mastery games (Experiment’s REMA neighbors). These game traits create inflection points in a game’s design – forcing the modes apart. As a designer, adding one mode’s traits will naturally push you to add more and more of that mode’s traits. If you have large amounts of randomness in your design, you’ll find your players pushing other Experiment traits on you, because your players are playing your game in Experiment mode, and they want to stay there. Experiment designers are often systems designers. While setting and world building are important to some Experiment games, most thrive off their choices. The expert Experiment designer can create systems that emulate a fantasy, abstracting away the perfect amount of detail while immersing the player in that world. The expert Experiment designer creates systems that inspire the imagination, and can get players to exploring every nuance. And the expert Experiment designer creates deep meaning out of these nuances, as they players come to truly understand what these systems say about the world. Commercially, Experiment games have been middle-of-the-road between Rollercoaster and Mastery games. Experiment games require more comprehension from the player then Rollercoaster games, which might explain their lower quantity and lower popularity. However, the breakout hits of the Experiment genre have also been huge hits. Players love playing with reality. “What can I do?” can seizes the imagination in ways no other genre can. Plus, a good Experiment game offers better value, often getting several plays and better avoiding the used bin. Experiment games are notoriously hard to review, because they are so player experience defined. The whole point of an Experiment game is your choices are your own. In fact, it’s often easiest to review what they aren’t, rather then what they are. Immersive games which strive to embed you in the game world itself, that create the illusion that you are actually there and that you have every choice a character of that world would have. Immersive games have been in the news. This subgenre inspires radical jealousy in Rollercoaster designers because it deeply engages players in avatars and settings, but the tension between Rollercoaster and Experiment games makes it very hard to achieve immersion outside of an Experiment context. Halfway there. Next: the newly revived Mastery games! * Mark Rosewater’s Timmy is, of course, the psychographic similar to the experience-driven Rollercoaster players, and Spike, as we’ll see, is a Mastery player. Vorthos and Melvin are forms of Application players.